Oculus VR is an American technology company founded by Palmer Luckey, Brendan Iribe, Jack McCauley, Michael Antonov, Nate Mitchell in July 2012 in Irvine, California, and now it is owned by Facebook for more details see this link. I already tested oculus couple months ago but didn’t find any bug on it, then in 17 Sep. 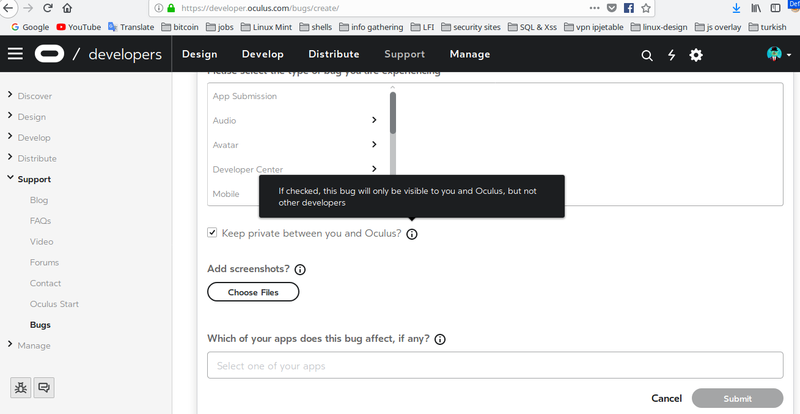 I decided to test it again, so While poking around Oculus Developer domain, I noticed an option called Report a Bug, where users can submit their bugs ( not security bugs) to oculus support team. 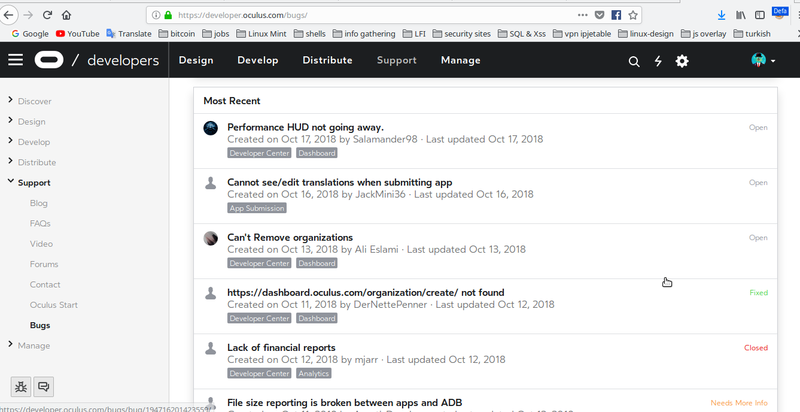 This is how the support Dashboard looks like, you can see other users public bugs. Users can submit their bugs with two ways, public bugs and private bugs. In public bugs, any one can add comments or reply to other comments. In private bugs, no one can add comments except the owner of the bug and the support team. Private bugs don’t appears in the dashboard from other users perspective. 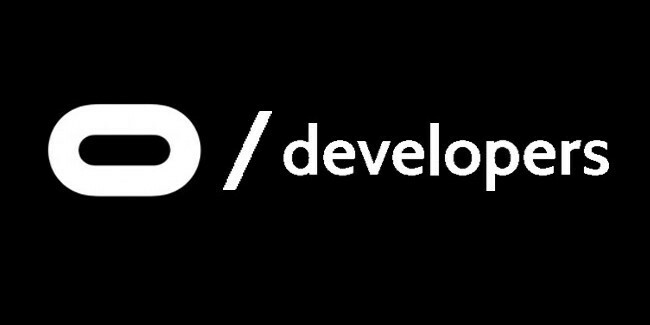 1- ”comment_parent_id” ==> refers to my bug ID (you can find any public bug ID from the URL link as https://developer.oculus.com/bugs/bug/your-bug-ID/). 2- ”external_post_id” ===> refers to the ID of the comment (my comment) that I replied to it. Plan B: I wanted to add comments on other users private bugs by replacing external_post_id value to other users value which is their comment ID in their private bug, I created two test accounts in order to reproduce this and it works like a charm and I bypassed their protection because they were checking only on the bug ID not external_post_id (comment ID). I knew that plan B will work when I was in the plan A stage, don’t ask my how ! !, I just felt it. Attacker bypassed oculus protection and added comment on victim private bug. 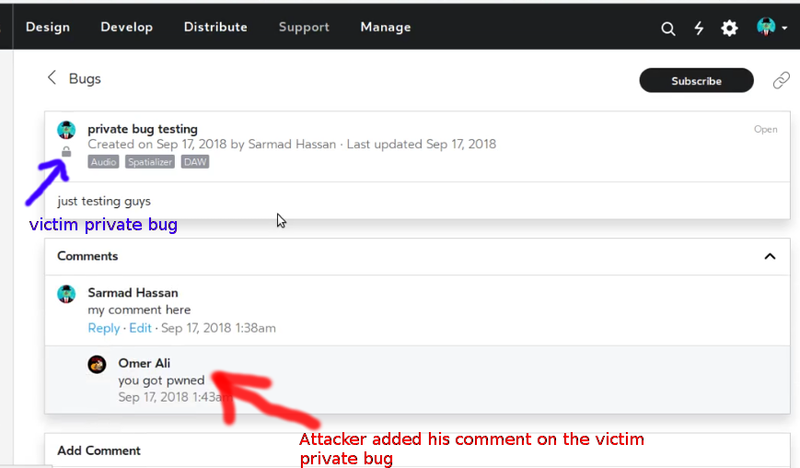 There was only one limitation in this bug, the question is how attacker can get other users comments ID from their Private bugs since their bugs set as private and as I mentioned before no one can see private bugs except the owner of the bug and the support team!!! it is really a good question, yes it is hard to find that but not impossible, let’s say someone was able to disclose other users comments IDs or attacker can make a list for random comments IDs and can perform a random attack and will add his comment on random private bugs, who know? everything is possible :), also I can say fixing this kind of bugs is always the right thing to do. 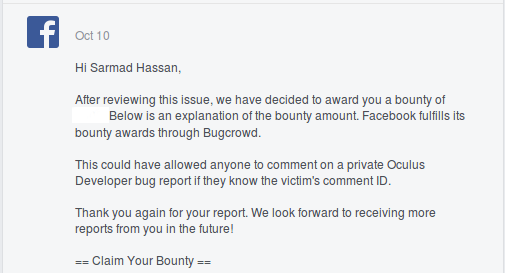 I reported this bug directly to Facebook Security Team and accepted it as valid bug. 1- Try to check your target from time to time as always. 2- Understand how the web app. work and what permissions you have.